hannah is one!.. & we just might survive this. 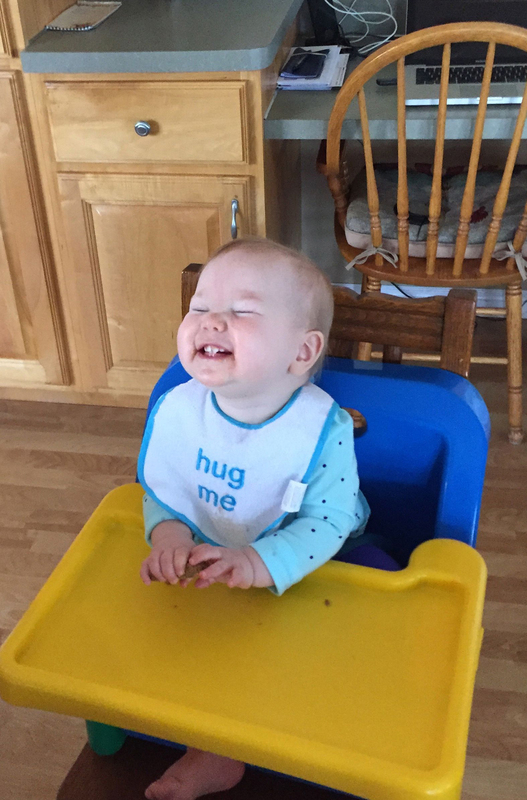 Hannah is one! Last week we enjoyed her big day. No offense to those very energetic moms out there who go all-out for a first birthday, but I am not one of them. It was a low-key day. Hannah enjoyed opening her gifts from her dad and I (a couple books), and in the evening our family all came over to celebrate. She got to eat a little pizza and downed an entire cupcake! She was spoiled with a boatload of books, some cute clothes and a few toys picked out by her cousins. She was wired until 9pm! So while we tried to keep her schedule and healthy meals as normal as possible, she did get a free pass for her birthday party. 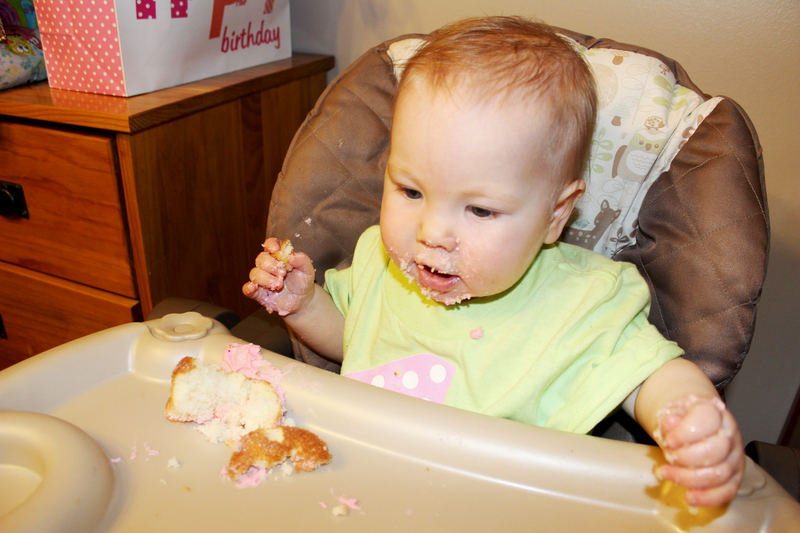 I don’t know about other moms out there, but a one-year-old birthday was kind of a personal milestone! We survived the first year! I was so scared of the actual birth. Petrified! And it happened in a blur, and then there were weeks of learning how to care for a newborn, and the postpartum healing and the pain and emotion that comes with nursing. The hormonal swings and the EXHAUSTION from the PURPLE Crying. Going back to work for a little while, but deciding to quit my job to stay home (working part time, mostly from home). Postpartum joint pain (I still have it) coupled with being chronically tired, so I feel like this year aged me about thirty. Washing all those diapers and carrying her around in that sling and all those drives around town and walks around the neighborhood desperate for her to nap. We survived it and came out the other side smiling and eating cake. Somehow that is kind of amazing! I wish the year hadn’t gone by so quickly. All the little and big moments. Rolling over and sitting up and crawling. Her first holidays and road trips and meeting her/our family and friends. The smiles and the giggles and the funny babbling and expressions. Having a little buddy with me everywhere I go. Seeing everything from the perspective of showing it to Hannah for the first time. I love teaching her about things in the world. 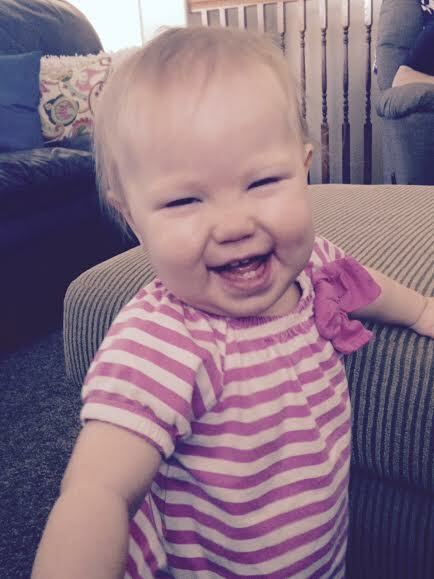 And she’s 1 now. It’s like a whole new set of milestones to look forward to just rolled out, but this time around we kind of know what we are doing. Or at least we are getting good at figuring it out as we go. I’ve actually had people ask me if I (/we) regret waiting so long to start a family. It’s a weird question to me (for many reasons) in part because I feel like we were a family before Hannah came along, just a different kind (proud dog-mom here!). But I suppose people around here (Utah) are curious because they’ve, for the most part, started much younger. Also, J and I were married for 9 years when Hannah was born, which really is quite a long time to be married without kids. There’s a dynamic shift for SURE once a baby comes along. And it’s true that there are great things about waiting and some more challenging things about being in your 30s/ after many years of marriage when you have kids. So I thought I would write a little about my experience waiting until I was 30 to get pregnant, in case it helps someone with their family planning decisions. Disclaimers: 1) There are lots of medical issues like fertility difficulties, which I am not going to address here. We fortunately did not experience that. This is simply my (/our) personal experience so far. 2) I realize that 30 is NOT OLD by any standard, including child-bearing! Women have perfectly healthy pregnancies later in life than I did. J and I were married 8 years before we got pregnant, which is a good deal of time to do things like improve our home(s), move a couple times, finish my advanced degree, go on some vacations, and save money. These, in my opinion, are all PROs in the waiting-to-have-kids department. I do not at all regret all of the things we got to do in our first years of marriage, as just a couple with two incomes. We walked that line between playing and being responsible really well… simultaneously having fun while getting our financial ducks in a row. If anything I wish we’d pinched pennies a *little* more because if I could have the cash back from all those Whole Foods trips and Starbucks runs I could clothe Hannah until she’s in first grade. But alas, we didn’t have many worries and still were able to save up. Obviously another benefit to waiting is the maturity and understanding of the world that comes from living in it for a while. Looking back to 10 (or even 5) years ago, I was (blissfully) unaware of things like factory farming, pesticides in our food, chemicals in our household products, the peril of our landfills, etc.. all of which now affect the daily decisions I make for raising a baby. I don’t judge moms for making different decisions with how they feed or diaper their own babies, but I feel like it’s important to make little decisions that I feel good about in my own household. Finally, a fringe benefit I didn’t expect from waiting to have a baby is that family and friends who’ve already done the baby years were so generous with passing on hand-me-down clothes, toys, gear, and plenty of advice (that last one.. take how you see fit). It’s been invaluable to know people who’ve been such good examples as parents. It’s saved us a bundle to inherit gently-loved baby gear. And when you’ve been in the workforce for a while your friends are a much older and financially-better off pool of gift-givers than you had when your were 20. Again – this I didn’t expect but we were truly HOOKED UP by our family and friends before Hannah even arrived. I feel so lucky for that! So, while I don’t regret waiting in the slightest, J and I say all the time that we don’t really know why we waited quite so long. We admittedly were scared of the idea of messing with a good thing, and time did sort of slip by, and before we knew it, it seemed like it had to be now or never. And then we did it, and it’s been amazing. It’s been such an adventure and I can’t imagine life without our little girl. Previous Previous post: 6 months! Next Next post: right now everyday distractions.